What Does Quin Snyder Look Like? 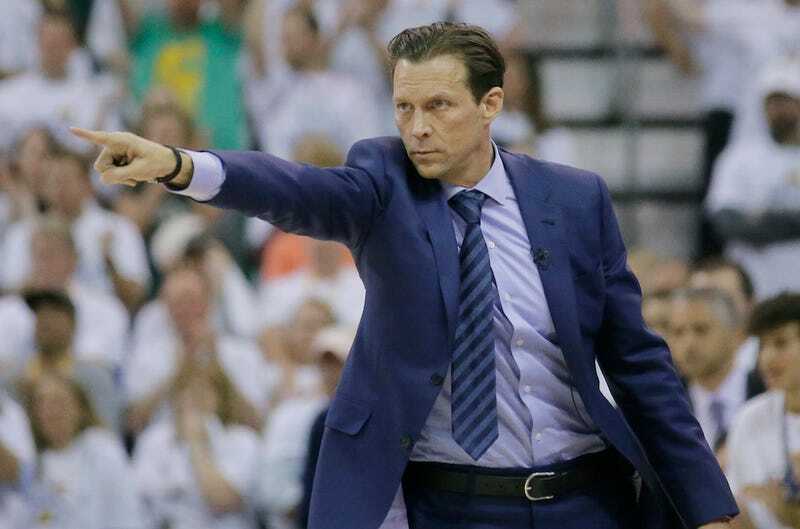 There isn’t much to say about the Utah Jazz, who have an incredibly tough task against the Warriors in their second-round series, but this is as good an opportunity as any to point out that head coach Quin Snyder looks like the villain from a 1990s comedy starring a former SNL cast member. Quin Snyder looks like he spends two uninterrupted months in Aspen. Quin Snyder looks like Tom Izzo’s smarter, wilier sibling. Quin Snyder looks like he had a non-speaking role as one of Patrick Bateman’s friends. Quin Snyder looks like he’s held a gun to Harrison Ford’s wife’s head on top of at least 15 different helipads. Quin Snyder looks like Kenickie from Grease started taking gym class seriously. Quin Snyder looks like the guy who tells the protagonist his consortium can make other ... arrangements if they can’t find his package by midnight. Quin Snyder looks like a composite of the results of 50 socialists being asked to describe their enemy. Quin Snyder looks like a more honest mascot for Duke. Ah, wait. Quin Snyder looks like what would happen if Willem Dafoe used one telepod while 1990s-era Christian Slater stuck his face through the other. When Did Gordon Hayward Turn Into A Doe-Eyed Channing Tatum? What Does Ryan Fitzpatrick Look Like?